Understanding the Benefits of Essential Nutrient Supplements. Essential = If something is classified as essential in nutritional or biochemical terms it means that the body cannot make it and must therefore receive it from the diet. Nutrient = A nutrient is something that the cells of the body require in order to function properly, keep health and avoid sickness. You are probably familiar with nutrients such as vitamin, minerals, fats, carbohydrates and proteins. Supplement = Aimed at providing sufficient ingestion of essential nutrients which are not readily available from the diet. Without these essential nutrients, proper health is impossible and illness is inevitable – they are literally that important in terms of determining quality and quantity of life. Innate Chiropractic can discuss your individual health needs and provide nutritiona supplement advice and products. Contact us to improve your health and wellness. In this day and age our diets have vastly changed from that of long ago and now include processed foods. These foods omit many nutrients including these essential nutrients. Even if you have a balanced diet, it is just not possible with our lifestyle of today to get enough of these essential nutrients. Innate Chiropractic offers health wellbeing. Keeping your whole body system healthy will help support the effects of your chiropractic treatment and care. Omega-3, Vitamin D and Probiotic deficiency is a casual factor in so many diverse health problems. These are essential nutrients that all humans require in sufficient amounts for health and the prevention of illness. Daily supplementation with these nutrients is not optional; it is essential for recovery, wellness and prevention. ever identified. Omega-3 EFAs are extremely important in the structure and function of every cell in the body and the function of your cells is what determines your health. Literally, the function and health of your cells determines every aspect of your health. EPA and DHA Omega-3 EFAs are part of every cell membrane and are required to maintain the proper shape, flexibility or fluidity, and “slipperiness” of cell membranes. 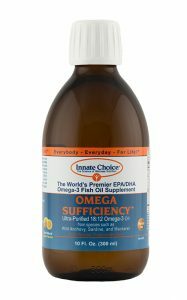 Omega-3 EFAs play a role in virtually every human function including growth and development, digestion,brain and nerve function, immune function, hormone production and regulation,maintenance of skin and bones, regulation of healing and inflammation, heart function, vision, cholesterol levels, and even emotions and behaviour. Being deficient in Vitamin D can lead to increased risk of many diseases. Conversely, being sufficient in Vitamin D is essential for wellness and prevention. Although most often categorised as a vitamin, Vitamin D is actually a hormone. Vitamins cannot be produced by the cells in your body and thus must be obtained via consumption from dietary sources. Vitamin D, however, can be made by the cells in your body in a process that involves the conversion of cholesterol derivatives into Vitamin D using sunlight. Vitamin D3 is produced in the skin of humans (and other vertebrates) after exposure to ultraviolet B light (UVB). Vitamin D3 only becomes biologically active after two conversions; one in the liver (primarily) to 25-hydroxyvitamin D (25 OHD), the circulating form of Vitamin D, and then in the kidney to 1,25-dihydroxyvitamin D (1,25 (OH)2D), the biologically active hormone form which is also know as calcitriol. Calcitriol or biologically active Vitamin D is often considered the most potent steroid hormone in human physiology. Like all steroid hormones, Vitamin D is involved in the genetic regulation of the production of proteins and enzymes which are essential for wellness and prevention. Many cells have Vitamin D receptors and many genes are influenced by the action of Vitamin D.
The World Health Organisation (WHO) has defined probiotics as “live micro-organisms which when administered in adequate amounts confer a health benefit on the host.” To put this simply, probiotics, which are also know as “intestinal microflora,” are “good bacteria” that live in our gastrointestinal (GI) tract and aid in promoting optimal health and preventing illness. Although these bacteria live throughout our intestinal tract, they are found in the highest concentrations at the far end of the small intestine and in the large intestine. Research has demonstrated that the total number of bacteria living in a healthy adult amounts to ten times more bacteria than the total number of cells in the human body. In fact, a healthy intestinal tract should contain up to 1kg of bacteria. Most of these organisms are either neutral or health promoting but some have the potential to cause illness (e.g. Salmonella or E. Coli). In order to be healthy and to prevent the colonisation of harmful bacteria, our GI tracts must contain sufficient numbers of health promoting beneficial bacteria.